As many of you may know, it's been just over six months since we said goodbye to our beloved pup, Frasier. The house has been quiet ever since. Too quiet, even. I miss the walks, the waking up to a sleepy schnauzer at my feet, the coming home to a bouncing furball whose only reason for existence is to spread joy to his people. We all miss these moments, and it hasn't been easy adjusting to life without his wacky presence. I guess that makes us dog people, and it's a label we wear proudly. It isn't convenient, cost-effective or logical to own a dog. Yet we do. Because life otherwise seems a little less complete, a little less rich. So after much discussion within our family, we decided to bring another pup into our home. The munchkin in the photo above is Calli - full name Calli Finn (short for Finnegan, of Mr. Dressup sock-puppet fame, because I'm weird like that.) 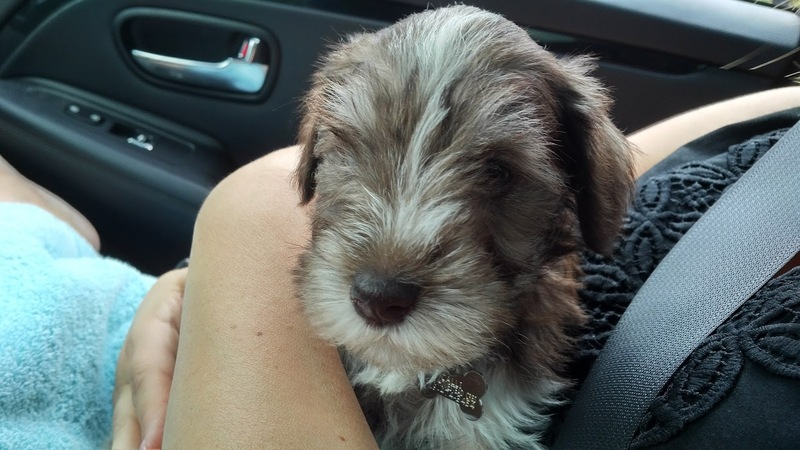 Like Frasier, she's a miniature schnauzer. She was born May 9th, and we brought her home earlier this afternoon. Here's what she looked like when she was two weeks old. For more pics, follow her on Instagram. We don't speak dog, so we couldn't really talk about her day with her before we tucked her into her new crate with her now-favorite toys (Eeyore is in the early lead) and watched her instantly drop into a deep sleep. But if she could talk, she'd probably tell us about what a tough day it was for her. About how she was taken by strange new people to a strange new place. I worried about that on the drive home. I hope she saw the day as a good one, as the beginning of an exciting new chapter in what we fervently hope is a happy, healthy and fun-filled life. I hope she knows how much we already love her. We're pretty sure the next few days, weeks and months will be sleep-deprived, mess-filled and generally chaotic as she adjusts to us and we do the same with her. I say this not because we cherish sleep or a perfectly neat house, because in my book that's not what qualifies as a life well lived. I'd gladly give up some zees in exchange for watching our kids continue to grow as people. Our first dog taught them so much about life and responsibility as they rose to the challenge of managing his diabetes. Whatever the future holds for Calli, I know she'll find some way to carve herself into their lives, as well. Because dogs make us better people. They make our kids better people, too. Welcome to the family, little one. We can't wait to see what adventures await us all. Your turn: Why do we love dogs as much as we do? Yesterday was this blog's 13th birthday* - or its bar mitzvah, if you're into that sort of thing. Which I was, once, but no longer am, as it's been a while since I was 13. But I digress. I started it before Facebook was a thing. The now-dominant social media giant existed on June 26, 2004, of course, but it was still The Facebook, an embryonic Web 2.0 experiment that classmates used as a digital hot-or-not service. Mere mortals still didn't have access. It was two years before Twitter launched, before social media was really on our radar. Before the iPhone. Sure, some suits carried BlackBerrys, but they were only about email and messaging back then. It was a radically different digital world, and blogging took the then-unidimensional web (surf, read, repeat) and gave everyday folks their own platform, their own voice. The rapid encroachment of all the things I mentioned above - and then some - has in a few short years transformed the blog from what was once a sign of digital savviness to a quaint relic of a bygone time when we put an i before everything and a number - 1.0, 2.0 - after everything. Quaint as it has become, however, I continue to write here because for all its network-based power, Facebook is ephemeral, and not something that is distinctly ours. What we post there is quickly absorbed into the past in a fast-moving timeline stuffed with ads, memes, Candy Crush top scores and conspiracy theories from folks you once loathed in high school and now, thanks to social media, loathe even more. Facebook is a busy place, where the vast majority of people we know tend to hang out. But it isn't ours. Or mine. It's like a busy airport terminal: Hardly a place you can call your own. Likewise, Twitter is too limited, too filled with bullies and trolls. Snapchat is where the kids hang out, and whatever we write will disappear in 10 seconds, anyway. As you go further down the list - to WhatsApp, Pinterest, LinkedIn and beyond - you get deeper into unique online sub-groups that further accentuate the modern mobile/social Internet's splintering effect. Which leaves the doddering old blog, where the number of comments in a month might equal what once flowed in before lunch. But when compared to today's far busier social platforms, it now represents something of a quiet spot from which we can watch the chaos unfold. Thirteen years on, the wonderful relationships I've formed through this blog continue in many forms - often on alternative platforms - and I sometimes wish we could rewind the clock to the days when this form of communication dominated the online landscape. But as I've said so many times before, technology moves in only one direction, and it's up to us to either adapt or fall off the back of the treadmill. This blog, like all blogs, may no longer be current, leading-edge or as uniquely relevant as it was back in 2004. But it's still my quiet little corner in a tumultuous online (and real) world, and I can't imagine not having this place to return to when I need a little word-based balancing between my ears. Behold my brightly-colored bicycle. 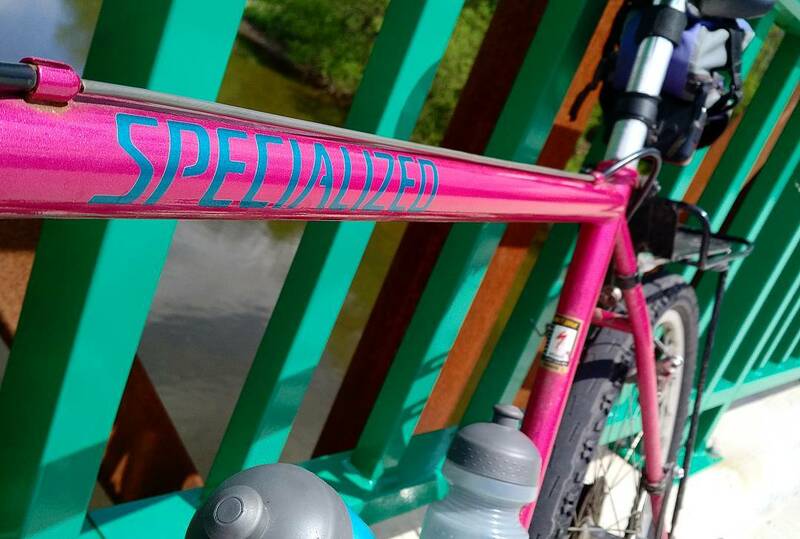 It's a Specialized StumpJumper Comp that I've had for longer than I dare admit. I'm not really about things, as I don't tend to covet physical objects or use them to define who I am in the eyes of others. But I love this bike. It fits me. It feels like it was made for me, and riding it - to/from work, or wandering the hinterlands that surround our town - is an indescribably joy because of this well-made-yet-simple machine. I'll never understand why Specialized painted a men's bike in burn-your-eyes pink, but I'm glad they did, because it makes me smile every time I walk up to it. Sometimes when I go somewhere, I'll take a picture of it in all its imperfect, dirty glory. Here, it's parked on a bridge over the Thames River in a lovely little town east of London. This was my first stretch-the-distance ride, where instead of riding in loops close to home I instead ventured further into the countryside. As I get deeper into the season, the distances get further and the rides get harder. But as long as I have this lovely pink thing - and a moment or two at the turnaround point to grab some pixels to remember the moment - I know I'll always find my way back home. With this in mind, let's celebrate all things pink for this week's Thematic. If it's any shade of this fab color, it's time to shoot a picture and share it. Who's with me? Your turn: Take a pic that suggests or evokes this week's theme, Pretty in Pink, and post it to your blog or website. Alternatively, find a pic you've already taken and/or posted. Leave a comment here letting folks know where to find it. Visit other participants to spread the photographic joy. And pop back again through the week to add additional pics as they occur to you. Head here for more background on how Thematic works. And please accept my thanks for making this little weekly photo-exploration exercise of ours such a joy. Drop the pen. Pick it up again. So it's been a while since I wrote anything new here, and given the fact that Written Inc. celebrates its bar mitzvah tomorrow (13! An adult!) I thought now would be a reasonable time to a) pick the pen back up and b) explain why I put it down in the first place. Quite simply, I haven't much felt like writing. We've had a lot on the go within my family - nothing terrible or earth-shattering, but intense enough that sitting down for regular keyboard-mashing sessions no longer topped the daily priority list. In other words, life happened, and it demanded our full attention. So rather than force myself to squeeze some words out that probably wouldn't have felt right, I decided relative silence was the preferred path. It's not like I wasn't creating, mind you, as I continued to post photos to my Instagram account - which then automatically ended up on my Facebook and Twitter streams, too. Awesome how technology works, isn't it? But there's a world of difference between fast-sharing a pic from your smartphone and taking the time to write something. And I was a writer before I was anything else. So while I think it was good for my writer's soul to be a non-writer for a bit, I suspect now it's time to fish the proverbial pen out of its shadowy nook in the far corner of my desk and use it for its intended purpose. Silence isn't meant to last forever, after all, and there's a lot of interesting stuff on the way over the next few days, weeks and months. Thanks for your patience. 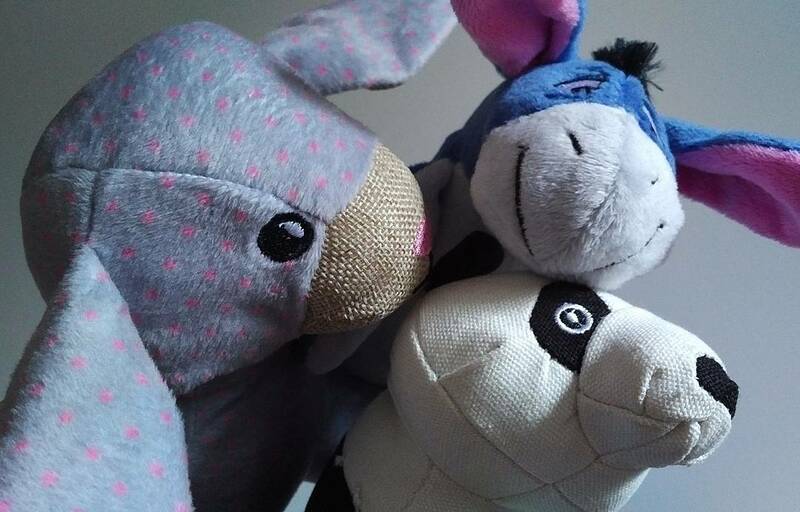 Oh yes, about this somewhat oddball picture: I'm the one who chose the panda, while the kids chose Eeyore (always my fave 100 Acre Wood resident) and the lamb. They sit, among way too many other stuffed toys, in a small-ish bin at the bottom landing of the stairs, just beside our living room. They're dog toys, and we bring Calli Finn home this Thursday*. The house has been too quiet for too long. It's time to start telling new stories, and celebrating new beginnings. Your turn: What else should I write about in the days to come? *Here's what she looked like the day we picked her out. She's a bit bigger now. "We've arranged a global civilization in which most crucial elements profoundly depend on science and technology. We have also arranged things so that almost no one understands science and technology. This is a prescription for disaster. We might get away with it for a while, but sooner or later this combustible mixture of ignorance and power is going to blow up in our faces."